I finally re-visited my chocolate lava cake recipe, and this new user-friendly version looks better, sounds better, and doesn't call for any extra-large eggs. I don’t remember why the original recipe called for them, but this updated formula uses the standard large variety, which should save me from answering another 300 emails. The original chocolate lava cake video recipe is probably the most watched, most commented, most emailed, and most linked-to recipe I've ever filmed. Most people like chocolate cake, but when you add "lava" to the name, they go completely mental. I also had the upcoming Valentine's Day in mind. For you single guys that aren't handsome, don't have money, and can't play a musical instrument, this may be the only arrow in Cupid's quiver. But take heart, it is a devastating weapon when used correctly. End your romantic home cooked meal with this dessert, and watch the magic. Enjoy! This... is quite frankly amazing. Since i live in England i wont be able to try it till tomorrow but i'm gonna be perfecting it till Valentines day. Thank you John, once again you amaze me. On a sep. note, I made the Sloppy Giuseppe's for the superbowl party, BIG HIT! Thanks for that. TECH NOTE: beeps being fixed! Ok,I gotta preface this with the simple fact that I love your site and have learned so-o-o-o much from you. That being said I gotta tell you that I love chocolate lave cake but really prefer the ones that are made by pushing a little ball of very cold ganache into the middle of each of the ramekins batter. This one seems like underdone cake to me. I store them in the 'frig and bake them right before I want to serve them. They keep for at least a week. I have never literally laughed-out-loud so many times watching a cooking video. This was priceless! My dad is always asking me when I'll make him some chocolate lava cake. I think you've just pushed me over the edge. Love the Le Creuset ramekins, by the way! Umm . . . how much flour, again? Chef John, stop it!! You are sabotaging my diet!!! Not that you're running a dating site, Chef John...but you sort of did started the thought train heading down this track. OMG!!! EGGS!!! UNCOOKED!!! HEAD EXPLODING!!! This looks so damn good but I'm afraid it would never ever turn out right for me. Plus I would be worried about the egg part not being cooked enough. Is it cooked enough? Why do you fill the pan with water? I gave this 5 stars and faved it on YT. water evens the heat transfer. even raw eggs are a 10,000 in 1 shot of killing you. I likes them odds. so it's like the same principle as a bain-marie? LOL! like I know what that is! I googled it. I made this but didn't quite cook it long enough. It was still delicious with a small scoop of homemade lavender ice cream. I'll make it again and cook it longer. Put chocolate and butter in a small bowl. Heat cream and pour over. Stir until mixed. Cool, then chill. Form into round balls and put into freezer until ready to use. Place 7 oz of dark chocolate and 8 oz butter in a metal bowl and melt over hot water bath. Remove from heat and add 1 tsp vanilla and 3 egg yolks, mixing until smooth. Sift 1/3 cup flour into chocolate mixture and mix until smooth. Beat 3 egg whites, 1/8 tsp cream of tartar and 1/8 tsp salt in a clean metal bowl until soft peaks form. Slowly add 1/4 cup sugar while continuing to beat. Fold whites into chocolate mixture 1/3 at a time. Pour into well buttered ramekins to about 3/4 full. Push one ball of ganache into each cake. At this point, you may refrigerate until just before you want to serve them. Let cool for about 5 minutes before unmolding. And.....enjoy. Oops, sorry to steal your material! Do yuo think this would work with GF flour too? Just made tonight, my ramekins were a little shorter but wider, still worked great. Did 17 minutes in oven, kenmore electric, and they were absolutley perfect! Cooked on all sides and lava in the middle! Thanks for all your videos! So I know you said it wouldn't work with white chocolate, but any suggestions on that account, since my wife's allergic to cocoa solids. Substituting a white chocolate bar is "easy", but what do you suggest to substitute for the cocoa powder? Aahzmandius Karrde--You could use the recipe sent in above and use white chocolate. OMG, that looks fantastically gooey. Love the video! Ach! Rammekins! Specialty equipment be derned! I'm going to have to try this with a cupcake pan. I cannot justify buying those cute little things for this one recipe. Yes, I suggest buying some ramekins. ;) (check garage sales, and seconds hand stores, they always seem to have some, also Ross stores. The lava cake is delicious, your videos are delicious too. I have seen a lot of cooking shows but none of those ever made me actually want to cook something. Thank you very much! this recipe looks smashing! it looks a little less liquid in the centre than the previous video though. hey, if ever you want some real authentic pure belgian chocolate sent by mail, I'll gladly be your "liaison officer"! Are you married? If you are do you have a single brother? cousin? uncle? grandfather? For those looking for ramekin substitutes, I use my Noritake teacups, everyday ware not china. They are just sturdy enough for lavacakes plus that nice handle makes them safer to remove from waterbath. You can probably find them at any used dishware site or Ebay. Jackie, thank you for your version of the lava cakes. A little more involved but I like the fact that I can bake on demand (store in fridge)until ready to enjoy. Chef John, not to worry, I will still check out Food Wishes for your wonderful entertaining food videos. Thanks for posting this great recipe! I can't wait to make it for my sweetheart on Valentine's day :) P.S. I love your other recipes and videos too! Brilliant recipe once again chef john, just wondering, is it possible to do the batter several nights before (putting the batter in the fridge) actually baking it and creating that molten goodness? Chef John, could you add a liqueur to this recipe for added specialness, say Frangelico for example? If you think this would be a good idea, how much would you suggest using? i've never tried, but you'd have to be careful not to thin out the batter. I would drizzle over the over after they are cooked! Is it possible to add a pinch of cayenne pepper to spice things up? If so... how much would you recommend? yes, but the pinch size is up to you. taste the batter. when u say butter, salt butter? or no salt? if we leave the batter in the ramekins overnight in the fridge, do i need to let them sit out for a bit before i put them in the oven? yes, i would leave out for 30 minutes before. i used your recipe for valentine's day and my boyfriend loved it! thanks so much for the easy to follow recipe!! i'm definitely going to find more things to make from your website! Where can I find those ceramic baking cups? hmmm. mine turned out bad. the exterior doesn't get solid like a cake. what could possibly be wrong? the instruction on the video seems quite easy. i used a bigger cup though, could that be the reason? yes, that's it. who told you u could use a bigger cup? can i use a microwave oven for this recipe? how long do you leave them in the fridge? hello. i've tried this four times, and everytime, the exterior of the cake is not as good looking as the one you made, mine looks all messy and it's so hard to take them off the cups, it usually breaks apart by the middle. but the taste is really really really good. I've tried baking it from 15-20 minutes but the result is almost the same, except when baked longer, the inside is not melting. so what am i missing here? Our family loves your blog Chef John. Your videos are awesome and help those of us who are not gifted in the kitchen to deliver meals that are out of this world. For those who have not tried these, they are rich and chocolatey and everyone loves them, and they are simple to make. We followed Chef John's instructions exactly and they were perfect. Thanks again for a great contribution to the lives of others. May there be many more recipes to come. what flour do you use? Hey I thought u said no more large eggs? Hey Chef John, I recently made this, but it didn't rise, it was still amazingly good though, but it was a little short and not tall like yours, could this be a mess-up on the Order of the ingredients entered? or not whisking the egg enough? as long as you followed the order of ingr. in the video it should be fine. It doesn't really rise. Only a little from the egg, and the it recedes. Yeah see, thats where i messed up, because i didn't have any pudding in it either. thanks! i'll try again in my cooking episodes. Can you add baking powder or soda to make it rise? you could, but why? it's not suppose to rise. It's suppose to be a dense gooey mess. Everytime i try to make it, it always is solid inside, should i take it out when the top is still mushy a little? or just becoming firm? plus when its solid its a little bitter from dark chocolate, should i add condensed milk? go by the time, youre cooking too long if its solid. you cant add con mlk. its not a sweet dessert, maybe you dont like it dark chocolate? dark chocolate isn't for everyone! Visited your blog for the first time today and love it! Entertaining to read/watch and I can't wait to try out a recipe. I'm having a dinner party and want to make the lava cakes. Does this recipe double easily and do I need to adjust the cooking time for 8? Oh one more thing...can I make it ahead of time and keep it in the fridge for longer than 30 mins (ie make it in the morning and bake it in the evening?) and if so, any other special requirements? Can i double the recipe? Do I then need to cook it longer? Unfortunately, I cannot eat chocolate at all (painless migraine sufferer) but I can at least enjoy watching someone else make something awesome with it. Tonight I cooked as our night before school starts meal your lemon chicken in yogurt and got "this is edible" (high praise from my 10 and 8 year old for protein based entrees believe me....i really enjoyed it and they ate it all) and I got "You HAVE to make this again!" for this. Hey Chef John, what happens if you do not use unsalted butter? Followed this recipe but came out like hockey pucks. Figured out the ramakins I was using were 7 oz and not 5oz so more surface area wider and got overcooked i guess. Will try again with bigger batch of batter and will err on side of undercooked when monitoring cooking time. Chef John, I just made this the other night for no particular reason other than the video made it look ultra yummy...followed everything to a T...it was fab!! So, incredibly easy to make...I'll definitely make this again...thank you for the recipe. 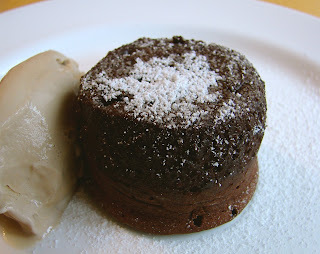 i love chocolate lava, usually when i was in indonesia or singapore there's always a place to eat this. but when i arrived in america,especially in texas(college station) i couldn't find any place to eat this cake that really taste great..
then i think i will try to make it for myself. i have a bunch of time during new year's holiday before my school starts. luv ur recipes.. I tried this one tonight. It's so HEAVENLY!!!! I'm literally melting with each bite!!! Linked your video on my Facebook. Thank you for this recipe. Hi, do we also let these sit for 15 minutes before turning them out, like we did in the old recipe? sounds redundant i know, but... you know how it is. Thanks a lot! Hey Chef John, thanks for the updated recipe! I remember making it two years ago for valentine days and it turned out perfect! Anyway, I ran into a little bit of trouble this time around. I now live in Colorado and the altitude didn't play well with the cake. I took the cakes out at exactly 15min as they were getting burnt (just slightly) around the edges. Let them sit to cool down and finish cooked and when I pulled them out the bottom half was still liquid -- however the top was good and cooked. Anyway, I did some research and all I could come up with was to lower the temp to about 400 and back a decent amount of time longer. Maybe even have the water bath sit in the oven a bit beforehand (as that seems to be where the problems lies). I'm just a little stumped here as I don't want the top (bottom really) to get all overcooked and chewy/burnt and not get the lava center. I would try to cover in foil to bake, with a few small holes to let out the steam, this may prevent the tops from getting crispy. wow... that's amazing... I am totally new to bakery... do I need to pre-heat the oven? I am trying your recipes like crazy. You are such a good teacher! I have a question for you about this cake. I made it, exactly like the recipe and video called for. The batter was much thicker than yours on the video and it wouldn't have filled up four 5.5 oz ramekins. I used 2.5 oz, and it only filled up three. What do you think caused it to thicken up? To much stirring with the flour in? no way to tell. Don't understand the quantity problem. If you're using the same amounts u should get the same number as me. 1. can i use all purpose flour with some baking powder in it? 3. can u plase tell the amount of buuter sugar and flour in ounces or grams? Why would you use flour with baking soda in it? I haven't tried that nor would I.
I would like to ask if 200ML ramkins or irregularly shaped ramekins (ie. flower or heart shaped) would work? Dear Chef John, thanks for the informative and really interesting video! Did you place the chilled ramekins immediately into the water bath and into the preheated oven? What is the reason for chilling the batter? I tried this the other day and it was fabulous! It is so difficult to find some ingredients in Czech Rep. but this was easy. My partner was trying to eat the mix even before it was cooked. I follow you blog quite a lot recently and I want to thank you for the great ideas! i have no ramekins, so i was wondering if i could make these in a cupcake pan ? if so what would the cooking time be. and how much should i fill it up? 2/3 way ? sorry, never tried muffin tins. some people made comments above regarding this, so maybe take a peek at those. i made them in a muffin pan.. took me 13 minutes to bake them. thanks for such an easy and yummy recipe :D i can post pix for the people who want to try it in a muffin pan :) best of luck people! can this dish be served cold? and if i don't have ramekins what else can i cook it in? how many grams is one tbsp? I don't have ramekins but I have small ceramic bowls; those chinese ones that can hold rice or soup. They are small and can hold about 200 ml of liquid. Will those work? The choc lava cake really turned out moist and delicious. When I inverted the cake, the top was a bit gooey and had some melted choc on top but otherwise the cake retained its perfect shape. Plus the inside was really like molten lava! Was the top suppose to be like that or should I have cooked it a bit longer? I baked it at 15 mins exactly. Ok. I failed here. Everything came out right with the batter. But when I took them out of the oven, the chocolate inside had been cooked. Should I keep it in for less time, next time, and how do I know when they're done? It's so easy to make this dessert! I don't have an oven nor ramekins at home. But managed to successfully bake this dessert in my little oven toaster for 3 minutes, using 8 3oz cupcake moulds. :) Love it! hey chef john. whats the size of ur ramekins? are they 4oz ramekins? Hi, is it bad if i don't use premium cocoa but use 95%cocoa instead(which is the only thing i have)? Is that bad? Loved your recipe. In my experiment, the taste turned out great, intense chocolatey. But I couldn't take the cake out of the ramekin; it got broken apart by the middle and top stayed in the ramekin. Then, I baked it a little longer. Again, it broke apart and this time without a lava inside. What can I do for that? Hey Chef John, I made this recipe tonight and ate it with vanilla icecream, turned out great! lol i watched the video of this recipe sooooo many times before i made it. i saw your comment about re-doing this recipe, looking forward to that. btw, i used the regular sized eggs. ..will try to do this later, im excited! will tell you if it works fine. Thanks for being selfless and sharing this wonderful recipes..
May I request for video of RUM CAKE? i really want to try that one too.. I love this recipe Chef John. I've tried it for several times and my older brother requests for it. He gives me all the ingredients needed. Thank you! Btw, I'm only 14 yrs. old. Hi, I've looked everywhere, but I want a real answer: do you need ceramic ramekins (I bet there's an alternate)? If not, what can I use that's cheaper but will produce the same delicioussss results? Sorry, I just don't know, I've only used ceramic ramekins and this method. I would have to experiment. How cute is your website!!! i found your onion rings recipe on youtube and i loved the way you made cooking fun! i bought chocolate and cocoa and will bake this cake tomorrow... Thanks a whole bunch! i dont have the ramekins. can I use muffin pan, and put it in a bigger pan for the water bath? Sorry, never tried, so may work but not sure of time temp difference. Check comments. I want to make this for christmas but i want it to be more cooked, will it get ruined if i leave it to cook for longer?! thanks!! we always buy this for our christmas desert but i want to make it this year! its not too good cooked through. better to just to google and find a nice chocolate decadence recipe. enjoy! I experimented last weekend. The taste was FABULOUS. Compared to what yours looks like, mine was less cooked on the edges and less lava-like in the middle. The consistency was more uniform from middle to edges. How do I correct this to make sure my lava is molten without it falling down? Hotter oven and shorter cook time? I went for 18 minutes because it looked too wet on top at 15. I'm trying to get this perfected for Christmas eve dinner. No, baking choc is unsweetened and will not work. After the results of my first attempt (see my comments above) I surmised I needed higher temp, shorter cooking time, or both. I inspected it at 10 minutes and the top was still wet, causing some concern. I put it in for another 2 minutes and then took it out but left it in the water bath for another 2 minutes before putting the ramekins on a cooling rack. Why the 2 minute water bath? My 12-yr old daughter was the chef, calling the shots, and I was just her assistant/advisor. She decided that would be the thing to do so I went with it. The result worked - it was softer inside than my first time and it looked like yours. I usually don't bake - I'd rather cook. But this recipe is worth perfecting and having in my quiver for special occasions. Next time I might experiment with a 10 or 11 minute baking time and immediately removing them to a cooling rack. I'll email you a pic of our results. i tested it just now for the upcoming valentine, surprisingly it came out beautiful, from the lava in the inside until the little crisp on the edgy top. i don't like the taste of it, however. it's bizarre, i love chocolat, and usually i love just every recipe u put in here. i tried a looooot of it, this is the first time it fails me. guess i'm not a good baker! gonna stick to cooking dinner instead of baking.. I noticed on your original recipe it called for 2tsp of cocoa powder and on this one it says 4tsp. I made this using 4tsp for my Valentine (who loved it, btw). It did taste a wee bit bitter and I wondered which measurement is appropriate 2 or 4 tsp? Thanks! I believe I did up it on this 2nd version. Maybe 3 is good for you? I've been making this chocolate lava cake for the past 3 weeks and after few tweaks it's become one of my favourite desserts ever. Of course, valrhona chocolate doesn't hurt haa. However, I keep noticing that the bottom of the cake (which becomes the top after you flip it over) always looks very wet even after I decreased the amount of butter i was smearing on the sides. Any suggestions on how to get rid of that? I don't know if you are going to answer this, but can I serve this beautiful dessert cold? Or does it have to be warm/hot? My birthday is coming up, I'm going to serve this to the guests, I'm just wondering, because I'm going to do the dessert before anything else, like appetizers and the main course. If it has to be warm, how can I heat it up afer the main course? Any tips? Should I just put it in the oven to get it warm? Thanks, love your blog! I would pick something else. It's not good cold, or reheated. Sorry! i want to know it the oven is 425° C? or F? Well I tried but it became moist chocolate cake, so I'll decrease the time next time. When I put in the flour, it doesn't become smooth anymore...a more gunky type...why does this happen? Did I stir too long? I'm such a noob so I don't really know. Luckily the cake was soo delicious! Can't answer the stirring question, sorry. The ingredients say 2 large eggs PLUS 2 more large egg yolks. Good luck. this is an amazing recipe! thaaanks! i made them, but for some reason the batter turned out much ticker than yours, although i only put 3 table spoons of flour. also they were not moist inside.. probably a combination for leaving them 17 minutes instead of 15 and the batter not being as fluid as it should be. hey chef, i went to the store (5 to be exact) and the only cocoa powder i found was Hershey's unsweetened cocoa powder, will it affect the taste? Does using somewhat larger bowls effect the outcome of making the cream not centered? Using 2 bowls with the same amount as the recipe. OMG! When I cut the lava cake and saw the chocolate flow out the cake, it almost made me cry. I cannot believe it. I did it, on the first try. The cakes look delicious and test great. I love your video for lava cake. Cooking is my passion as well. However I am not a Chef like your self.I will be back to try all your recipes.I added a link to one of my favorite recipes (Chocolate Floating Pudding). I noticed that in your video the bottom was all baked too leaving the center molten but my 1st 2 was all top = bake, bottom = molten (the rest overbaked). Is this because of ramekins that allows it leave the center molten and the rest baked? Or is it I put too much water in the casserole dish? On the happier part, I know when to stop mixing after the flour, making the cakes look smooth. Wow, this is really something special. I actually ordered some ramekins specifically to make this after watching the video (hint hint set up an amazon affiliate link for the supplies...) and it was totally worth it. I particularly like how the cakes come out in person sized servings and how the texture is rich and moist without being too buttery or overwhelming. I guess the cocao adds some dry chocolateness. Having a texture gradient makes the cake fun to eat and interesting throughout, like a Thai ice tea. I actually forgot to butter the ramkins first but I was able to get the cakes out ok anyway with a little careful prodding. My wife was super happy. Thanks so much! but i got one very very big question... how to make the inside of the cake more wet and heavy... i mean when u cut the cake, i want the inside to be very heavy and wet.. i know it already has the wet and heavy feel.. but i wan MORE!!!!!! haha!!! nevertheless, THANK YOU FOR SETTING UP THIS BLOG!!!! oo and pardon my bad english haha!! Do you use selfrising flour or just regular flour? Does increasing the ingredients increase the baking time? You're so funny i love your videos! 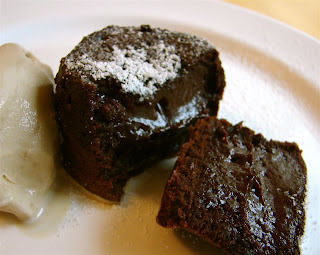 Hi im from Singapore and im going to try your lava cake recipe now ^^ Just for my boyfriend, coming out of army this wed! Question is, Can i chill it overnight (2 nights) so i can bake it on wed ? i m planning to prepare this for his birthday ( Coming April 28).So i want to know whether can i make it of birthday cake size? If so can u plz tell me the measurements. Ohk.. :( np.. Can u please tell me the Chocolate cake recipe.. Though i got few recipes, i just want to follow ur recipes so i will be very glad if u provide me chocolate cake recipe. theyre gonna go perfectly with my chocolate covered starwberries and champagne sorbet!! can i use baking squares instead of a chocolate bar? So anybody who tries this recipe, don't give up if you fail! Keep working at it! Don't give up if you fail, I finally did at my 5th time! For those who have larger ramekins hence flatter cakes, make it another half more and maybe 5 minutes extra for oven time(Your oven could be different than mine and also I put 2 at a time due the space constraints of my oven)? And instead of letting it cool in the ramekins for 15 minutes, you can take it out and let it cool by it self. If not it would overbake from the heat of the ramekins. chef john, i followed carefully the instructions, but it didn't turn out the way you did. the lava part is missing, it's pure cake... what shall i do? How much Rum you think I could get away with using in this recipe without messing it up? Soak in a little rum after it's cooked! My wife and i made your "Cherry Surprise Lava Cakes" and were stunned by how good they came out. I realize that the omission of placing a single pitted Cherry in each half filled ramekin then adding the rest of the batter on top was just to keep the time down. Genius as usual Chef! Why doesn't it taste as good if reheated? Will the inside be cooked or is it better to be eaten fresh? I'm planning to give this to my crush cause she loves chocolate. Thanks! just wanted to know can u chill them for over half a hour. can i have the recipe in metric? i am not use to measuring in tbsp! I don't have metric. But if you google you find tons of converters. Hello Chef, I just found your site yesterday and already have made 4 recipes! amazing! one question on this one, should the oven be turned on from the top and the bottom?, and on which rack should I put them? Thanks for a great recipe Chef John! I've made this several times now and it always turns out great. I'm not sure I would have attempted it if it wasn't for your easy-to-follow video and laid-back style. Thanks again! Recipe worked well especially as i've never attempted a dessert before. Thanks Chef. I'm well stuffed. Hi, for the oven temperature what is it in celsius? Can you do me a favour and tell me which cocoa powder you used ? Chef John, I posted this q earlier today then forgot where I posted it (duh!! ), I wanted to ask what size ramekins you use? They look like the smaller ones but perfect size for chocolate desserts! I am looking to buy my first batch; what would be work for most preparations? The one at my store stated as 9cm/4in if that sounds right? do I necessarily need to bake it in the pan 1/2 way filled with water? What happens if without water? Am I risking that the sides and the bottom gets over baked? Thanks for this great recipe.